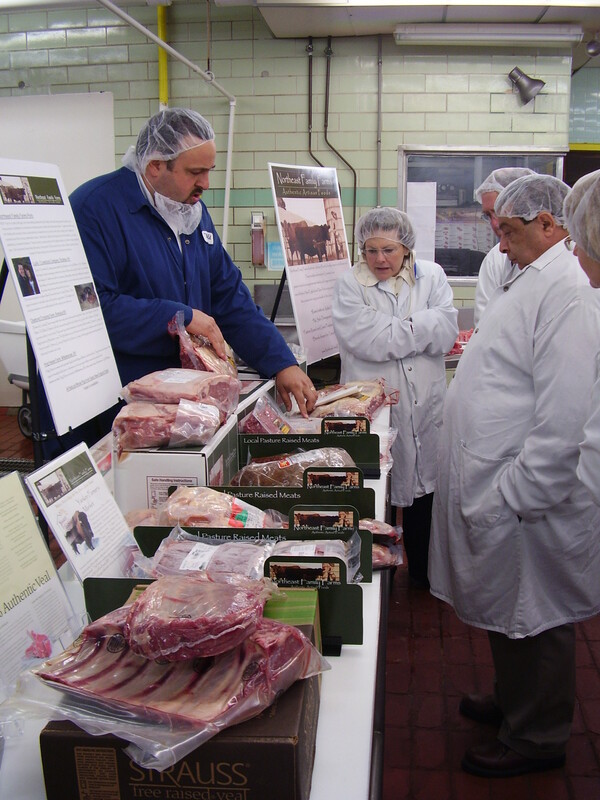 The Healthy Food in Health Care program encourages hospitals to purchase meat and poultry produced without routine, non-therapeutic antibiotics. Through our Antibiotics in Animal Agriculture initiative, hospitals transition their purchases while joining other institutions and supply chain partners to transform the marketplace. Encourage producers to alter productions systems to address crowding and sanitation so they no longer require these drug inputs. Organizations like our own are joining other institutional sectors to ensure antibiotics are not routinely used in animal production. This includes organizations like School Food FOCUS, which feeds 2.3 million students across the United States and others like Real Food Challenge representing more than 300 colleges and universities, and 300,000 students across the nation. Transition Hospital Purchasing to Protect Antibiotics. 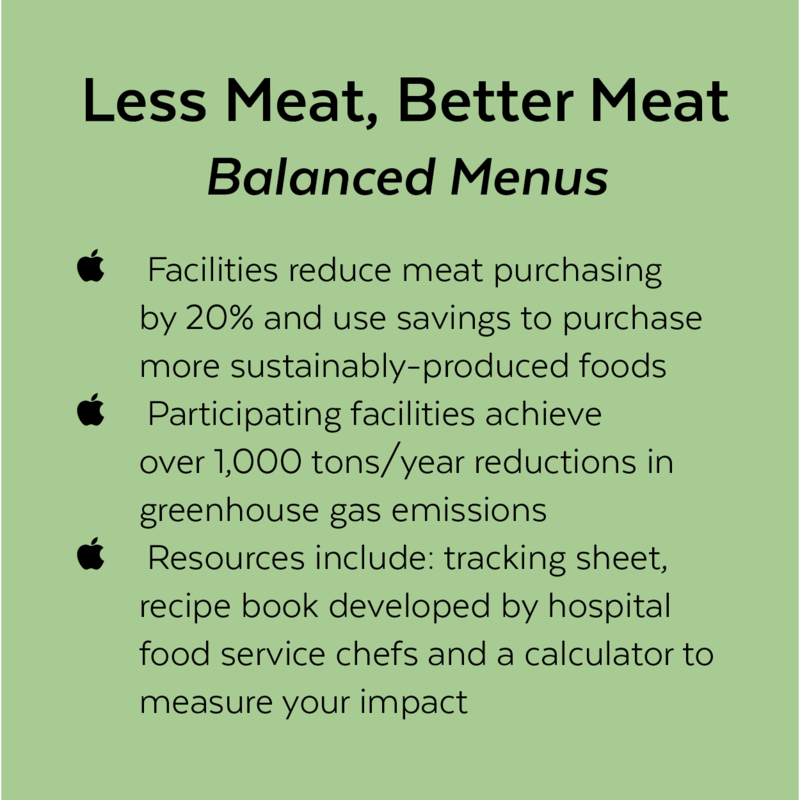 Implement Balanced Menus: The Less Meat, Better Meat to address the public and environmental health concerns associated with meat production and consumption. Join Forces to Transform the Supply Chain. Find a HFHC Program in your region to collaborate with other hospitals and institutions to aggregate and amplify demand for meat raised without routine antibiotics. For Practice Greenhealth Members Systems, consider joining* the National Market Transformation Group (MTG) where health systems bring their leadership voice and aggregated buying power to accelerate the development and availability of sustainable products into the marketplace. Contact us for more information. *Membership in the MTG is limited to Health Systems that are members of Practice Greenhealth. Suppliers, distributors, group purchasing organizations and other relevant parties may be invited by the MTG to participate in webinars, conference calls and in-person meetings but are not eligible for membership in the MTG. Promoting and Marketing Antibiotic Stewardship Through Food Service: A guide for food service staff to educate and incentivize around meat and poultry raised without routine antibiotics. Mythbusting for Food Service: Separating Fact from Fiction Around Antibiotics: Health Care Without Harm debunked four of the toughest myths regularly encountered in hospital food service. Webinars that explore how health care can prevent overuse of antibiotics in animal agriculture through procurement choices. Marketing and Promotion to Support Purchasing Strategies Webinar - Learn from others who have had success and receive tips and tools for building your program. Speakers included Kurt Roessler, Patti Oliver, and Hillary Bisnett.